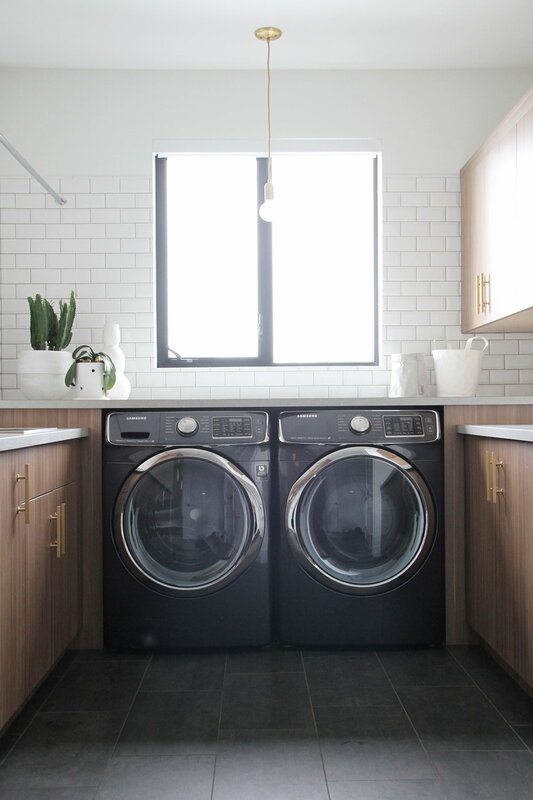 It's laundry room reveal day! It's easy to dismiss a room as a purely functional and utilitarian space and not give it much thought or effort. But whenever we decide to start a new project big or small I flip right into full design/plan/execute mode! And once my mind is set on something, I do whatever it takes to fulfill that vision (within a reasonable budget of course). Thank you Dennis for dealing with my stubbornness. 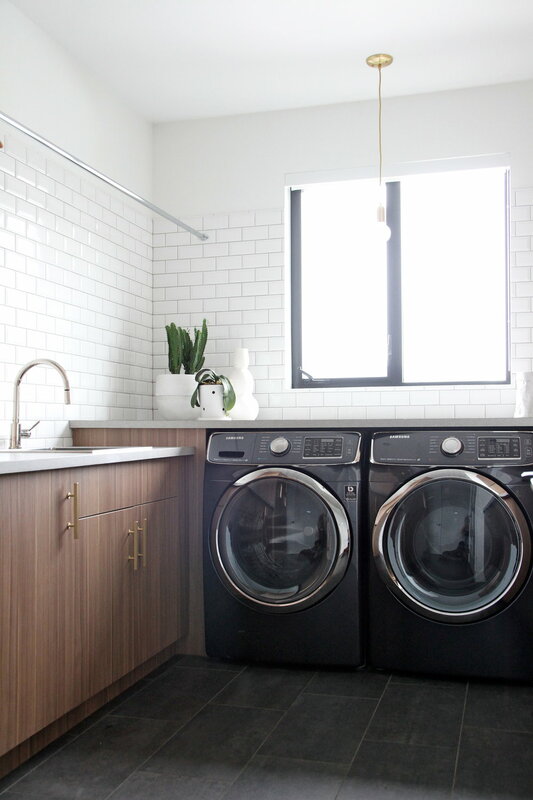 Now since this is a laundry room, we needed a place to hang clothes. I wanted something simple that didn't take up too much space so we added a closet rod that extends from the wall all the way over to the cabinets. This has worked out perfectly as it gives us lots of space to hang clothes! Our laundry room is located on the main floor of our house. It's sandwiched between the kitchen and the garage which means that it also serves as a bit of a mudroom. So it needed to have a closet and lots of storage space. Other must-have features I needed in my laundry room included a deep sink and plenty of counter space for folding clothes. I intentionally kept everything soft and neutral to create a calming atmosphere while featuring a combination of crisp whites, modern lines and luxe materials that feel on trend yet unique and timeless. I also couldn't resist including some greenery! I mean who doesn't love a cactus and a few orchids! White Subway Tile Backsplash - Small's Tile & Flooring. Tile Flooring - Small's Tile & Flooring. Riobel Faucet - Bath's by Design. Wall Colour - Benjamin Moore 'White Heron'. Lew's Hardware Bar Pull Series in Brushed Brass. Light Fixture - similar here and here.